Can’t wait to get this new book! 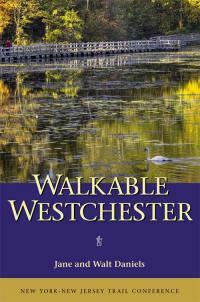 Walkable Westchester – A Walking Guide to Westchester County, NY by Jane and Walt Daniels, Published by the New York New Jersey Trail Conference. The book covers over 180 parks with almost 600 miles of trails in Westchester County. It includes sketch maps of all but the smallest parks. Public transportation options are included where available. There is extensive history of the parks and the people involved. Icons show parks suitable for the handicapped, bikes, horses, dogs and cross country skiing. Many parks have photos that show what to expect to see when you visit. The parks are arranged by size classes and have a locator map to show approximately where they are in the county. 448 pages. ISBN 978-1-880775-57-8. Westchester.nynjtc.org has additional information and some suggested hikes. The site also has a great map of Westchester showing a great overview of all the trails and parks covered in the book. …The hours spent bringing the book to publication are enormous. Aside from the cartographer, Allison Werberg and book designer/layout artist, Nora Porter, all others involved in the project are volunteers. Any profits from the sale of Walkable Westchester are a gift from Jane and Walt to the Trail Conference.